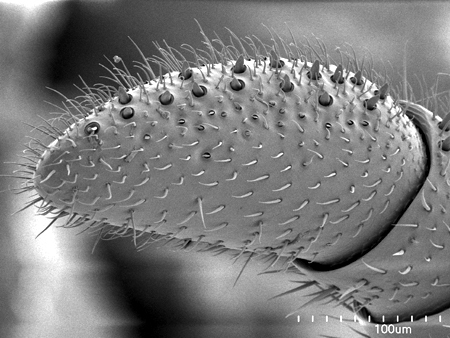 This image shows the surface of the tip of the antenna in the African driver ant Dorylus helvolus. 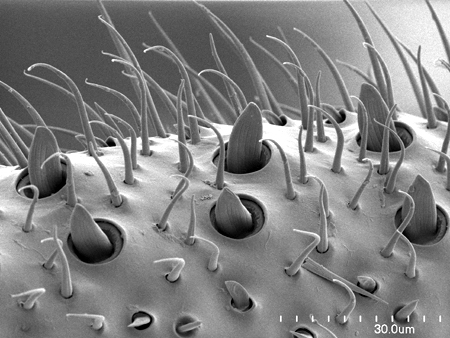 The tongue-shaped structures are one of the many types of hair-like sensory organs called sensillae trichoidea (Latin for, well, hair-like sensory organs). These organs are basically composed of a central piece of cuticle in the shape of a long filament or short paddle inserted into a socket and kept in place by a membranous ring. The central piece, thus, can freely move in all direction allowed by the socket. The most common sensillae trichoidea covering the hard and otherwise numb exoskeleton of adult ants (and Arthropods in general) are of the mechanoreceptor or tactile type, that is, the sense of touch. If you want to know how does it feel to have an insect sense of touch just comb your hair or gently brush the hairs on your arm. Other types of sensillae trichoidea are involve in sensing humidity, heat, and various chemical compounds, the latter providing the insect with a sense of smell. It is not surprising then, that the largest concentration of sensillae in an insect occurs at the tip of the antennae. We can infer from the two large, well-developed antennae in ants that these insects have a great sense of smell. Moreover, keeping them widely apart from each other at the sides of the head means they are able to smell in stereo. Sensillae trichoidea are not, however, homogeneously distributed across the apex of the antennae. They are mostly concentrated on the inner ventral surface: extend your arms forward with the palms of your hands facing down, the sensillae will occur in greater number where your thumbs are. This arrangement is particularly suited to smell whatever is in front of your head. The particular antenna pictured here is rather simple compared to what can be found in most ants, where sensillae are more numerous, more densely packet and much more varied in terms of types. Its simplicity in this case is probably correlated with the extreme specialization in predatory habits displayed by members of this army ant genus.